He Never Died begins with a day in the life of protagonist Jack (Henry Rollins) - a 'muttering man' of reclusion, routine and relatively few words who spends most of his time alone in his New York apartment, sleeping or zoning out in front of the TV. Visited by his elderly landlady, Jack pays the rent from a chest beneath his bed that is full of hard cash and various antique items (including a visible gun), and in a brief conversation expresses to her his confusion about the precise date and time. He visits the local church - although, it will turn out, for bingo rather than religion, in the apparently incongruous company of senior citizens and retirees. He has a 'discreet' meeting with medical intern Jeremy (Booboo Stewart) in a carpark, paying him in cash for a plastic-wrapped package that ends up in his refrigerator. And he has a meal and a cup of tea, as always, at a diner in Times Square where he either fails to notice or simply ignores the interest shown him by waitress Cara (Kate Greenhouse). The landlady comes calling with once-a-month regularity, but on this day there are two more knocks at Jack's door that are destined to throw his quiet life into disarray. The first is from Andrea (Jordan Todosey), the now 19-year-old daughter Jack never knew he had. The second is from a pair of thuggish debt collectors looking for Jeremy - and Jack's efficient 'interaction' with them will quickly draw the kind of criminal attention that he has been trying for years to avoid. Jack's tattoos - and the two deep, symmetrically placed scars on his back - suggest a man whose history is inscribed in his body, even if he shows a remarkable capacity to heal from any fresh wounds. Despite his ascetic existence, free of meat, alcohol, cigarettes or even company (social let alone sexual), it seems clear that Jack has at some point fallen and is struggling to pick himself up again, with a trail of bad blood behind him that keeps leading trouble right back to him. And though his response to almost every confronting situation is a jaded sigh, it also seems clear that a part of him likes trouble, and has a lot of past experience in dealing with it. Played with a gruff minimalism, Jack is from the start a figure of mystery, but also one who, poker-faced like the professional gambler he once was, will take his good sweet time to open up and offer anything like an explanation of who he is and what he has done to lead to such a cursed life of exile from humanity. Writer/director Jason Krawczyk, too, is in no hurry to give the game away, devoting the first third of the film to a carefully observed portrait of this man's strange, hermetic lifestyle, before finally, 32 minutes in, showing him pushed off the wagon and back into his former ways - and with Jack, old habits really do die hard. From here on we see Jack not just engaging aggressively for the first time in a while with strangers in the outside world, but also struggling with himself, as his basic drives and appetites enter an age-old conflict with his higher values, and as his long dormant sense of family attachment is reawakened along with his old killer instincts. Jack comes with A History of Violence - and in case we miss the reference to Cronenberg's comic-book saga of family and criminality, here too a key outburst that brings the hidden hero out into the open takes place in a traditional diner. Yet if this kind of narrative has been seen many times before, Krawczyk makes a virtue of gradually revealing just how very old his story really is, and along the way does a subversive job of reinventing various genres by reinvesting them with their fundamentals. For, despite the contemporary metropolitan setting, He Never Died is, as the title slyly suggests, timeless in its scope, and although the film features many acts of brutal violence, Krawczyk is far more concerned with the mythic morality that underlies them. To reveal much more would be to ruin the surprise: suffice it to say that, as Jack's personal drama of recovery and relapse unfolds, there are always, in parallel with the more genre-bound motifs to which Krawczyk gives a welcome spin, preoccupations of an ethical, even theological bent to ensure that Jack's travails resonate through time. The problem of evil that he embodies cannot simply be resolved with fists, knives or bullets. Musician Rollins is often known for his over-the-top presence in films (like Wrong Turn 2: Dead End), but in He Never Died he offers a performance of immense containment and restraint. This is matched by the film itself, which often elides its more bloodthirsty moments, cutting away to exterior shots - or to the aftermath. The result is an action film (of sorts) with most of the action stripped away, leaving just the bare bones of malicious intent - and of the damage left in its vindictive wake. Krawczyk's understated approach to this material, reflected in Rollins' unforthcoming, caged-beast turn, creates a brooding tension, but is also, in its deadpan way, very funny. Meanwhile, Daniel Pellerin's disorienting sound design, mixing the audio of charging horses, clashing blades, Nazi rallies and gun battles, makes a soundscape of endless strife the constant unquiet backdrop to Jack's withdrawal from an extended career of murder. Whether that retirement is merely temporary, or a long road to redemption, is left open. After all, you never know who else, in the fullness of time, might come knocking on the door. 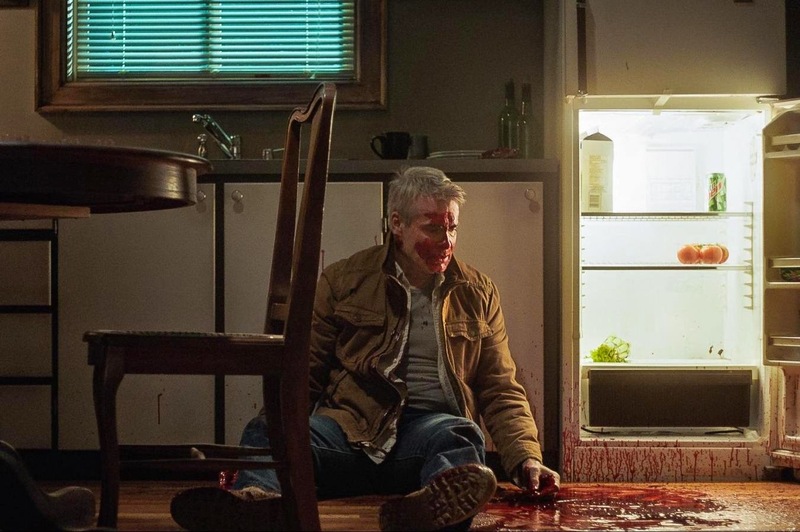 He Never Died screened at South by Southwest 2015. No confirmed release dates yet.